Who is your child, truly? How have they arrived in this world? Right from the start our children have their very own ‘style’. If we wish to parent with the heart in mind, recognising and responding to the temperament of each child is hugely important. Recognising the innate temperament of our child can help us, and them, hugely. Our relationships are far more harmonious when we work WITH their nature, rather than against it, either accidentally by not realising what they need, or deliberately in an attempt to change them. When our child experiences the world differently from us, or others we know, we may feel we need to ‘fix’ them. This can equally apply to the very active child who parents hope to calm, or the very quiet and observant child who is ‘socialised’ in a bid to get them to engage more with others. Our own feelings of discomfort, our experiences, and society’s judgments all compound this view that there is a right or wrong temperament in our young children (and therefore in ourselves). This is just not true, and the quicker we understand this, the more we can convey this to our child that their true self is OK.
Introverted or extraverted, high energy or low, very reactive or less so, these are ways of being, not characteristics to classify as good or bad. There will be characteristics that we find easier to work with, or are more familiar to us, but even the child who has more unknowns and differences, is not ‘wrong’. It is so essential that WE know this, and they FEEL this. We will learn more in our journey as a parent, and a person, when we seek to understand our child as they are, and make space for this real self in our lives. 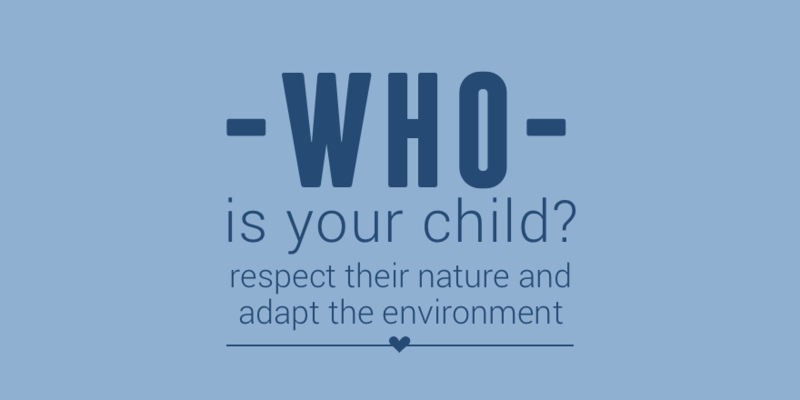 Adapt the child or adapt the environment? If we’ve been blessed with a very active child, we can allow for plenty of physical activity, and limit the expectations for sitting quietly in meetings or performances, for example. If instead our child prefers quieter settings, we’ll ensure some quiet retreat spaces at home, and maybe opt out of overwhelming and boisterous indoor playground parties. Adapting the environment, rather than the child is always a more gentle approach. The interesting thing is that if we respect the nature of our child as it is, we give them room to grow, and actually explore other possibilities and ways of being in their own time. The things we worry about when they’re young will develop as the child does - they wont always be as quiet, as persistent, ‘as’ anything. They will ‘grow into themselves’ as it were. Newer PostTrust or rescue? - do you 'spot' them or 'stop' them?